Many autobiographers share profound questions about human life with their readers—questions like: To what extent was my life imposed on me? To what extent did I bring it about through particular choices and actions, through the activity of my own will? Indeed, the issue of the will is central to autobiographical writing, and some of the greatest autobiographies give extended consideration to the will—its nature; its powers; its limitations; the forms of freedom, constraint, and expression it finds in various cultures; its role in particular human lives. In this new study, unprecedented in subject and scope, Richard Freadman offers the first sustained account of how changing theological, philosophical, and psychological accounts of the human will have been reflected in the writing of autobiography, and of how autobiography in its turn has helped shape various understandings of the will. Early chapters trace narrative representations of the will from antiquity (the Greeks and Augustine) to postmodernism (Derrida and Barthes), with particular emphasis on late modernity’s culture of the will. Later chapters then present detailed and powerfully original readings of autobiographical texts by Louis Althusser, Roland Barthes, B. F. Skinner, Ernest Hemingway, Simone de Beauvoir, Arthur Koestler, Stephen Spender, and Diana Trilling. Freadman’s interdisciplinary approach to autobiography and the will includes a theoretical defense of the view that autobiographers are, in varying degrees, agents in their own texts. 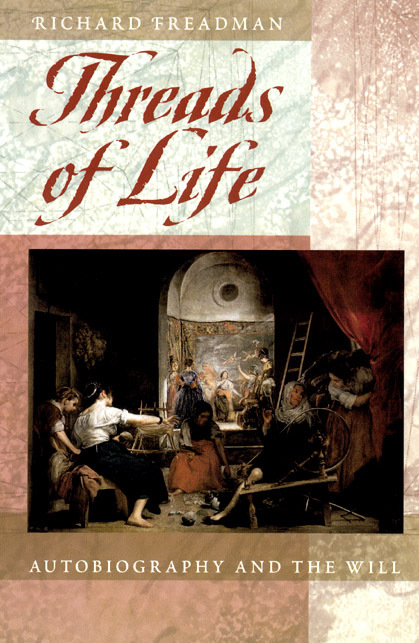 Threads of Life argues that late modernity has inherited deeply conflicted attitudes to the will. Freadman suggests that these attitudes, now deeply embedded in contemporary cultural discourse, need reexamining. In this, he contends, ’reflective autobiography’ has an important part to play. 5. "Being and Making Oneself Be"
8. "Custodians of Their Own Fates"?